Halloween is a favorite holiday for many kids. But Halloween candy isn’t always a favorite for parents. 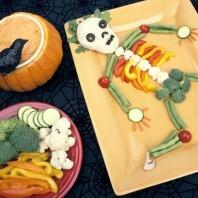 How can parents keep the joy of Halloween, and still make sure our kids are eating healthy? Here are some tips you can try at school or at home! 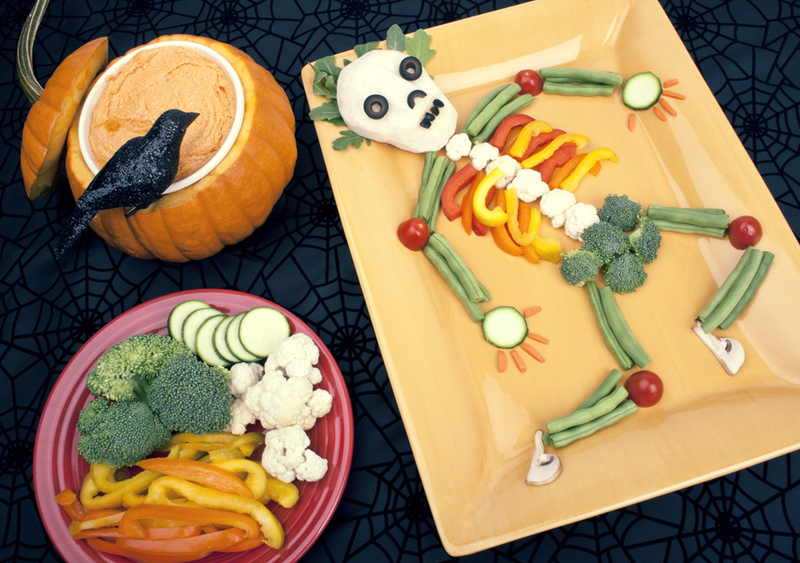 Get creative with fruits and veggies at your next holiday party! 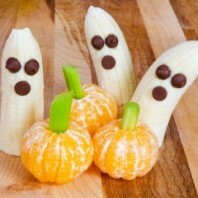 Banana ghosts and mandarin orange pumpkins. Avoid banning candy altogether. Studies show that kids who are not allowed to eat candy tend to eat more forbidden foods when they have access to them than kids who are allowed treats regularly. Help your child learn how to manage sweets. On Halloween night they can eat as much candy as they want, but after that candy can only be eaten as dessert with a meal or at snack time. If your child can follow the rules, they get to keep control of their stash. 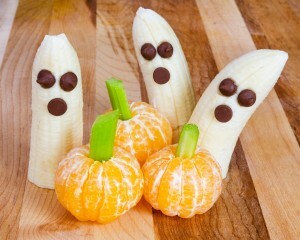 If you limit the number of pieces a child can eat at a given time, let the child choose which kinds of candy they want. Food $ense educator Candida plans a visit from the “Sugar Ghost.” Her kids choose a certain amount of candy to keep, and the rest goes into a bowl. At night, the Sugar Ghost (aka Candida) replaces the candy in the bowl with toys or other small gifts. Trick or Treat for Unicef, or collect change for another charity instead of candy. Find more info at http://www.unicefusa.org/trick-or-treatRemember: If you and your family are eating a healthy, balanced diet most of the time, special treats or “sometimes” foods at Halloween or other holidays are okay!For more tips, see this article from the Ellyn Satter Institute, available in English and Spanish.